San Remo is just 30 kilometers east of Monaco as crow flies. That is why the character of the event is very similar to that of Monte Carlo Rally. It is also one of the reasons why San Remo has been under threat of being replaced, to reduce Mediterranean emphasis of the WRC. Rally is currently held on twisty mountain roads (picture right bottom). Fall date means that roads are covered with fallen leaves and morning stages are often still slippery from humidity. Rain is also constant threat, making tyre choice sometimes quite difficult. First held in 1928 and known as Rally of the Flowers, name that derived from spring date and area's flower farming background. Continuously held from 1961, the rally has been part of the WRC every year since series started except in 1995. Originally held both on dirt and asphalt roads but starting from 1997 rally has been all-tarmac event. 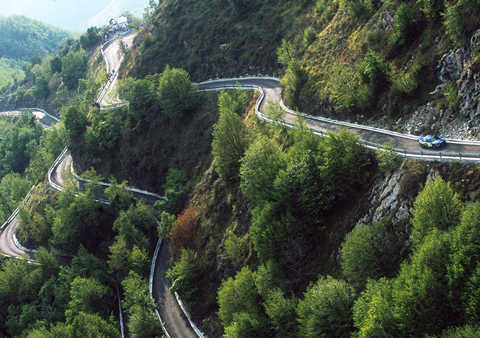 While trend in World Rallying has been towards ever more compact route, San Remo organisers have lately achieved miracles. 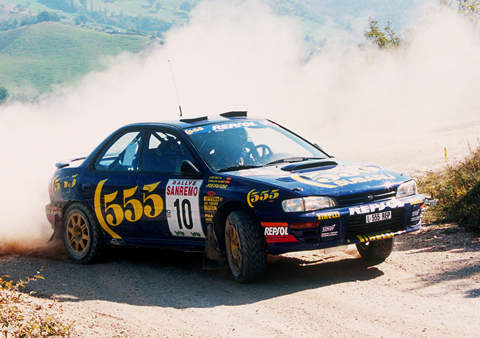 In 2000, they called the event as a "rally on a racetrack" since each of the three legs used only two stages, each run twice on both directions. Above everything else, one incident makes San Remo notoriously historical. In 1986 rally stewards and scrutineers ruled that "skirts" of the Peugeot 205T16E2 were illegal and excluded all works Peugeots, handing easy victory to Lancia. Peugeot protested but were not allowed to continue. FIA later that year confirmed that skirts were legal and annulled the results of the rally. That is why San Remo 1986 is NOT counted as WRC event in history books and statistics. Event ran its course but posthumously lost its WRC status. That is not the only controversy in the history of the event. In 1976 Lancia team boss Cesare Fiorio held up Bjorn Waldegard so that he would start into the final stage with same total time as Sandro Munari. Enraged swede flew through the stage to win by four seconds. On the positive side, San Remo is first ever rally to be won by a woman (Michele Mouton in 1981).